You’ve Got This. We Can Help. Whether it’s an unexpected car repair or visit to the ER, life happens to everyone and sometimes all you really need is some extra cash quickly. 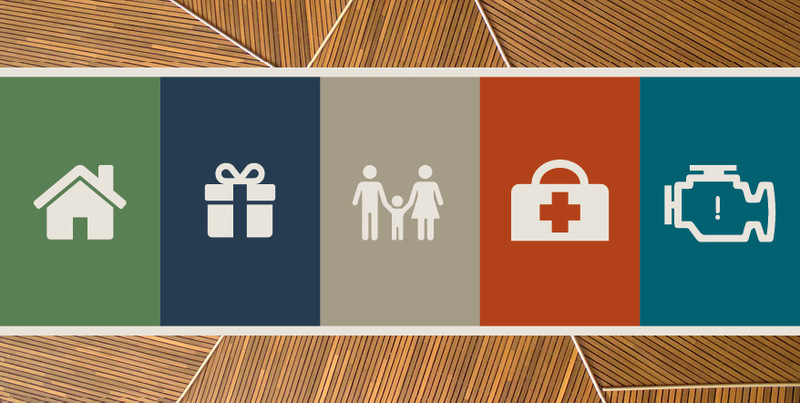 Northwest Cash and Northwest Cash Plus are two new products to help you get money fast when life throws something unexpected at you. These loans are easy, immediate, and applying won’t ding your credit report. You can apply for Northwest Cash or Northwest Cash Plus via online banking or inside your mobile app. If you’re approved for the loan, you own it—no need to get additional signatures or cosigners. Note that only primary account holders with regular share accounts are eligible to apply for these loans. You’ll find out immediately what you qualify for. Decisions are based on your history with Northwest Community Credit Union, which means that your other credit history won’t affect whether you get a loan or not. If you’re approved for a loan, you’ll see the money (minus a small origination fee, if it’s a Northwest Cash Plus loan) deposited to your account immediately the same day! These loans are an easy, fast way to get the cash you need without huge payday loan rates or fees. Have a valid email address on file. Sign into online banking or your mobile app. Click Services in the menu. Under Services, click or tap Northwest Cash. Fill out the application and click Submit. If approved, click on the Terms & Conditions and review them. You can either Accept the terms to proceed or Decline to end the process and cancel the loan. Loan funds are automatically deposited into the account you specify. Your single, one-time payment for the Northwest Cash loan will automatically be withdrawn from the account the loan was deposited into in 60 days. * You can change this method at any time after the loan is funded. 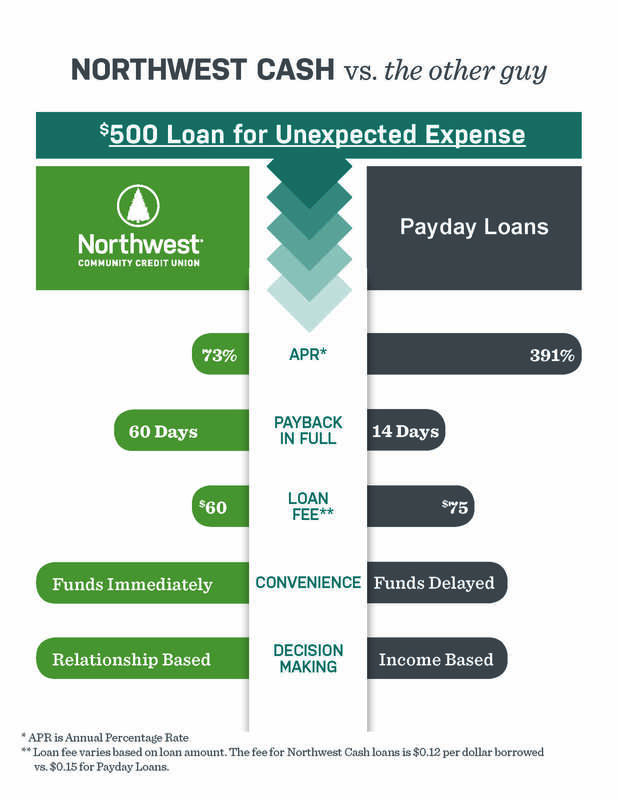 The full amount of the Northwest Cash loan must be repaid within 60 days. Partial or full payments made prior to 60 will have no pre-payment penalty. A late fee of 5% of the payment owed applies if a scheduled Northwest Cash Plus payment is not made within 10 days of the due date. We’re not able to do payment extensions or due date changes for Northwest Cash or Northwest Cash Plus loans. Memberships must be established for 60 days to be eligible for Northwest Cash. Northwest Cash costs the member $12 per $100 borrowed, which is a continuous function ($150 costs $18). This equates to a 73% APR** based on a 60-day repayment term. Loans may range from $150 to $700. Repayment must be made within 60 days. The full amount of the loan is due at the 60-day mark. Partial or full payments may be made prior to 60 days with no pre-payment penalty. A member may have no more than two Northwest Cash loans at a time and the combined maximum at any one time is $700. There is no late fee on a Northwest Cash loan. If your account has insufficient funds, it will be considered a returned payment, and will result in a fee (as with other consumer loans). Memberships must be established for 10 months to be eligible for Northwest Cash Plus. Northwest Cash Plus loans are priced between 36% - 45.4% APR**. In addition to the annual percentage rate, there is a $25 origination fee. Loans may range from $701 to $4,000. A late fee of 5% of the payment owed applies if a scheduled payment is not made within 10 days of the due date. Returned payments will result in a fee, as with other consumer loans. Payment frequency is monthly. Members may select from the following days of the month for their due dates: 1st, 5th, 10th, 15th, 20th, 25th. *Please note that automatic payments are not a requirement of Northwest Cash or Northwest Cash Plus, and our underwriting decision does not factor into the repayment method. Give us a call at (800) 452-9515 for more information about Northwest Cash or Northwest Cash Plus.